Deliveroo, a company that provides the delivery service, marketing, and order taking of various restaurants in association with Emirates Wildlife Society-World Wildlife Fund is spearheading a long-term effort in helping reduce plastic waste across UAE. Their long-term vision involves collaborating with restaurant partners and educating consumers on how they can do their part in decreasing plastic pollution through the following initiatives. In the 11th of May, Deliveroo launched their “opt in for cutlery” feature in their app and website to reduce wasted plastic cutlery. Upon introduction in the UAE, all of the restaurants involved in the program reported a reduction in the amount of plastic cutlery being sent out with food orders. Deliveroo believes that this delivery option will decrease the demand for disposable plastic cutlery at least by over 50%. Deliveroo also launched a series of restaurant trainings where environmental experts at Emirates Wildlife Society-WWF educated restaurant partners on the best eco-friendly practices that they can emulate to help achieve environmental sustainability. The trainings featured topics such as environmentally friendly packaging, supply chains and purchasing practices, recycling, and more. Last but not least, they focused on informing consumers about eco-friendly practices that can help the environment. This includes sending an email to customers to inform them that each time they order without disposable cutlery, they are embracing the call to live in an eco-friendly manner. Nemo Diving Center worked closely with Deliveroo and Emirates Wildlife Society-WWF in organizing a team clean-up dive which aimed to clean up part of the ocean in the UAE. The event was held last October 31, 2018 and had a great turnout of volunteer divers who all shared a commitment to protect and preserve the marine environment. Before the actual dive, the group gathered together for a detailed briefing about how to safely collect trash and then we suited up and hit the water carrying our mesh bags with us. 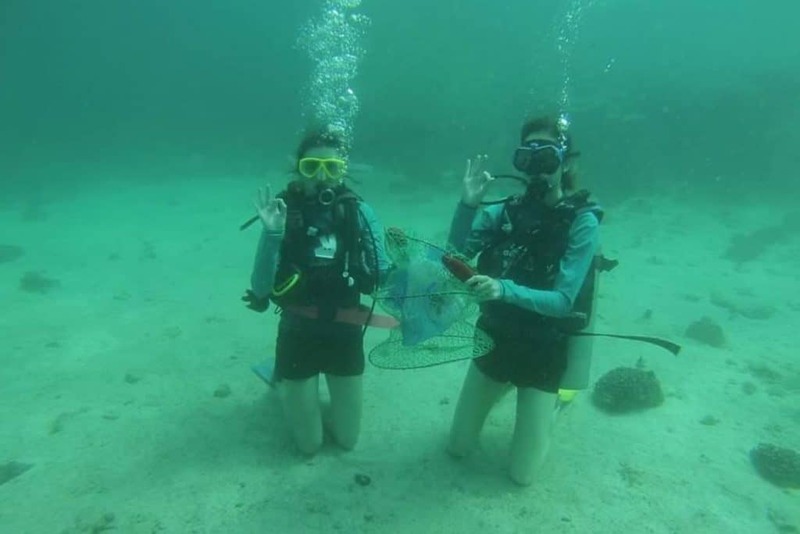 We had a productive dive as we collected whatever garbage and other debris we encountered in the ocean among them are plastic bags, plastic bottles, aluminum cans, discarded fishing gear, and different types of disposable plastic items and food packaging. Trash from inland eventually finds its way to the ocean where they pose a threat to marine life. Garbage can be mistaken as food or entangle marine animals. In fact, tens of thousands of whales, fish, turtles, birds, and seals die every year from plastic ingestion and entanglement. 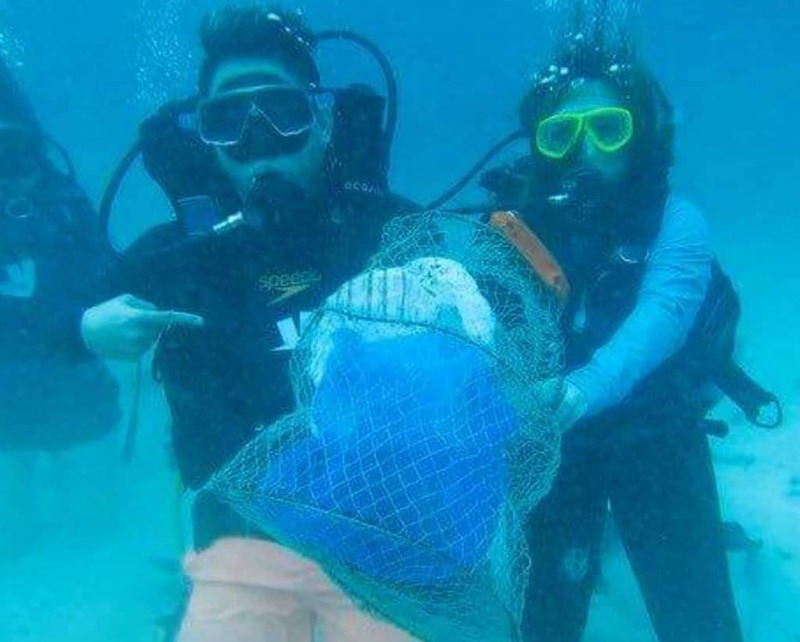 Plastic bags, like the ones we fished out of the sea, are one of the biggest culprits responsible for marine casualties because animals especially turtles and fish confuse them for jellyfish. When ingested, plastic bags cannot be digested and stays in the creature’s gut. Plastic disrupts the animal’s ability to digest food which can lead to a slow and painful death. Our good friends also hauled in plastic and aluminum containers which are also hazardous to marine creatures. Perhaps you have seen a photo or a video of a poor seal with its snout stuck in an aluminum can or a bird with its head stuck in a plastic cup. If the trapped animal is lucky enough, it could wiggle its way out from its deadly predicament but not all creatures get a lucky break. Many end up suffocating to death or tormented for long periods until a kind diver chances upon it and frees it from its plastic or tin prison. Another type of trash we collected are discarded fishing lines which can entangle and drown ocean dwellers. Do you remember the sea turtle that we saved at Dibba Rock, Fujairah? We encountered the poor fella with fishing lines entangled around one of its flippers. It was a lucky day for that turtle because we cut off the fishing cord that was deeply embedded in its flipper and affecting its blood circulation. If we didn’t come across that turtle, it would probably be suffering until now. 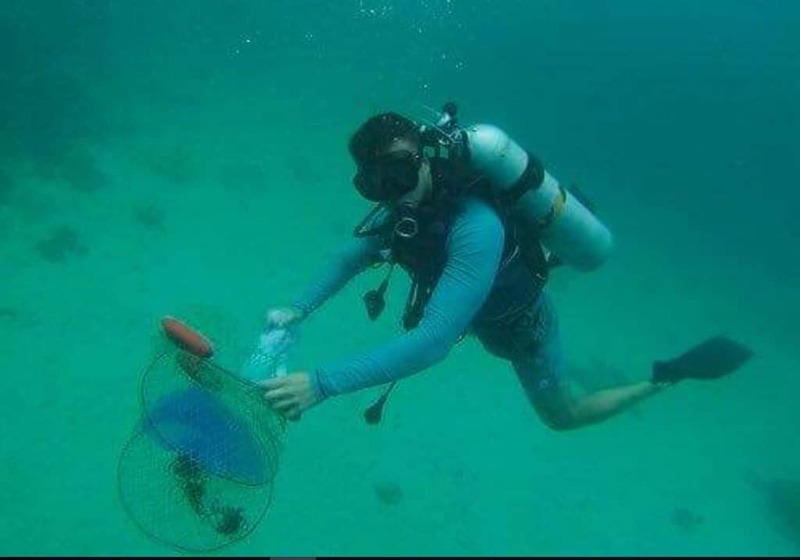 The recent clean-up dive with Deliveroo in partnership with Emirates Wildlife Society-WWF is a good way to remove discarded human rubbish from our beloved ocean and prevent reefs from becoming trash sites. Every single piece of plastic bag, plastic bottle, plastic container, aluminum can, or string of fishing net or cord that we remove from the ocean means one less hazardous debris in the ocean. 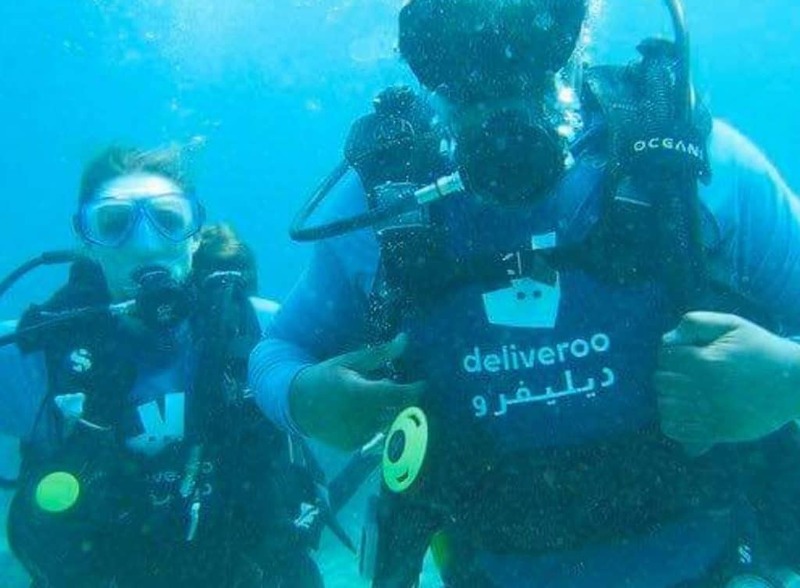 Nemo Diving Center commends Deliveroo in their goal to start working on becoming a more environmentally friendly company and reducing their impact on the planet. We believe that by doing our share in keeping the ocean clean, we give back to Mother Nature and help save the lives of many marine animals.